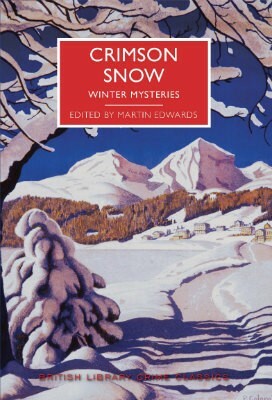 Crimson Snow winter mysteries is a collection of vintage crime short stories edited by Martin Edwards. Reading this book gave me an opportunity to read a lot of vintage crime authors that I hadn’t read before. The contributors are: Fergus Hume, Edgar Wallace, Margery Allingham, S.C. Roberts, Victor Gunn, Christopher Bush, Ianthe Jerrold, Macdonald Hastings, Julian Symons, Michael Gilbert and Josephine Bell. Most of the stories are fairly short but the one by Victor Gunn is about seventy pages long so it’s really a novella and I don’t know if it’s because that one is longer – but I think it’s my favourite story. I’ll definitely be looking for more books by Victor Gunn anyway. I’ve seen a lot of his books on my travels but had no idea what they would be like and didn’t give them a go. No doubt now I won’t see any of his books in shops for yonks. That’s what happened to me with Dornford Yates, he was all over the place until Valerie said some of his books were good – and now they’ve disappeared after me being just about haunted by them previously. I enjoyed this collection of short stories which are all set around winter/Christmas celebrations although the stories that I liked least were the ones by authors that I’ve read most. Margery Allingham and Macdonald Hastings disappointed me, maybe I just expected too much of them. Published by British Library Crime Classics of course and the cover is taken from a vintage St Moritz travel poster. There’s a wee biography of each writer on the page before their story begins, which was interesting but I would have liked it if they had also added the date the story was originally published and which magazine it first appeared in. That’s me nit-picking though. This was perfect Christmas bedtime reading, why is murder and Christmas such a good combination? !